While trolling around on Pinterest for inspiration, I came across this image. I found it attractive, and classic at the same time. Foolish me, I took note of the image, associated it with other Bauhaus artists that inspire me and got to work thinking about how I could translate this into a woven piece suitable for one of my traveling handlooms. For the next two weeks. I could not make that image come into my feed again. Little did I know what I had stumbled upon. This was a work of one of the big artists in my era – Sol LeWitt, he was based in New York City , my childhood cultural mecca during the 1960’s and 1970’s. Mom brought us children to the city at least monthly for cultural events, music, art, etc. I grew up thinking everyone went to the Met, MoMA, Carnegie Hall and Radio City Music Hall on a regular basis. It’s what you do when school’s out or on a weekend; take a train, walk the city, come home excited but exhausted. He had an entry-level job as a night receptionist and clerk he took in 1960 at the Museum of Modern Art (MoMA) in New York. Paragraphs on Conceptual Art LeWitt asserted that Conceptual Art was neither mathematical nor intellectual but intuitive, given that the complexity inherent to transforming an idea into a work of art was fraught with contingencies. 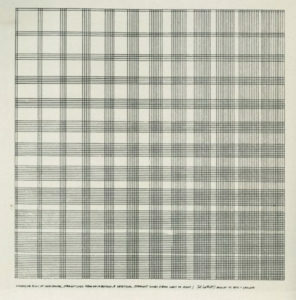 LeWitt’s art is not about the singular hand of the artist; it is the idea behind each work that surpass the work itself. Sol LeWitt dedicated his wall drawing to Josef Albers, whose colour theory and practice was a significant influence on his own development. 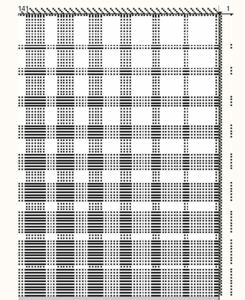 Even if LeWitt and Albers are separated by a fundamentally different understanding of their work, what is valid for both artists is their avoidance of any emphatic idea of authorship, their surmounting of any hierarchic model of composition and the way they, in general, objectify the work concept in which a single piece is always part of a long term serial study. I saw this piece, and instantly set about figuring how a warp like this could be created. I drew a simple draft. Note, my draft is backwards as the orientation of the work was not most critical in my mind, but the mechanics behind the pattern was. Sol LeWitt increased the black lines by 1 in every block and began his work with a minimum of two blocks. The grid used, was very similar to the one he used for his cubes. Which explains the two black lines around the outside. From there I decided to build on this pattern principle, I wanted a draft with 200 threads, 10 blocks of 20 threads each and I was home free! Next step was to wind this warp, each set of blocks would require a different number of threads in black and white. 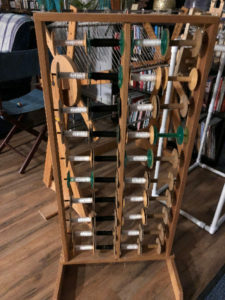 I fashioned my own sectional warping system from a reel that was donated to me by a weaving friend. 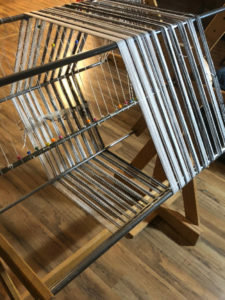 I used a velvet cantra frame to hold the AVL tension box, and a LeClerc spool rack for the 30 bobbins needed. Yes, I am an engineer and I think of these types of things often. I then transferred the warp from the reel to the Ashford Katie loom I was going to weave it on. I threaded the 8 shafts in a straight threading keeping my options open for structure changes. The reed in the loom is a 10 dpi read and I sleyed it at two threads per dent. 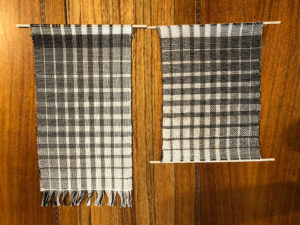 Warp was composed of 10/2 cotton in black and white. One of the first things that I noticed, if the sleying/threading was not correct, all of the black threads would not rise to the top at the same time. This was a clue to go back and double check my work. I found the warp quick to proof in this way. 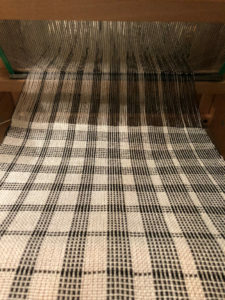 My first sample was woven in a plain weave with a sett of 20 ends per inch, half the threads up on each throw of the shuttle. It was easy to start with the white on the left and know which lever to throw with each pass, until you began to add the black. Then I needed to check what the last throw was to determine the next. In my zeal to finish the sample, Ihad abandoned the draft, and resorted to looking and counting. In some ways it was slow going, the piece took about 4 hours to weave only because I made mistakes and had to undo and redo my work. What did I gain from this approach, more of a reliance on what my eyes saw in the cloth versus what the draft said to do. 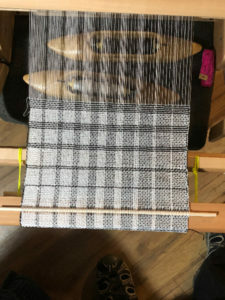 Some of the first steps in design on the loom. 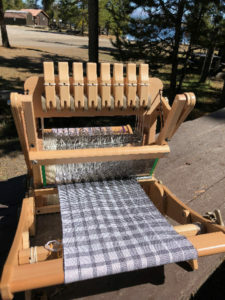 From the photo of the loom you can see I wove this piece outside while camping. What troubled me about the piece was that it was not square, each block was taller than long, the sett was quite loose for the thread. 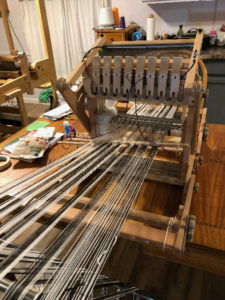 The loom is only 12 inches wide, lowering the sett was not a practical solution for this loom. 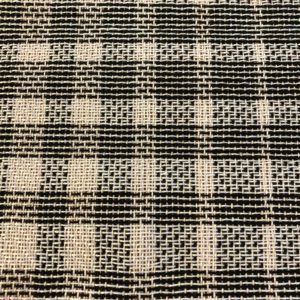 For the second sample I chose to switch to a twill structure which allowed the threads to collapse down on each other a bit more. I measured the block and I was very close to square, I felt it was close enough to continue. During this weaving I made note that if I was not careful with the levers, and picked a 2&7 combination instead of 2&5, I began to see a log cabin or shadow weave variation appear in the warp. Twice, I needed to unweave large sections of the warp to remove this undesirable optical effect. There was much more I want to weave and try on this warp. But time is short, and I will have to leave it to some of my students to complete. I am pleased that Sol LeWitt’s work translated so well into weaving. 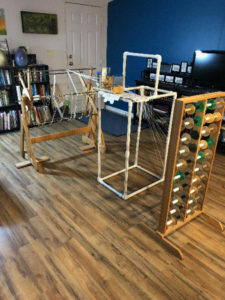 It provides a great study for practicing design principles while on the loom. I can now see the difference the structure will make in both the range of values, and the size of the pixel. Click here to purchase draft package of the 50 Shades of Grey Challenge. Package includes computerized draft for weaving software .wif file, and non-computerized draft in PDF format, as well as a PDF with pictures detailing the project.